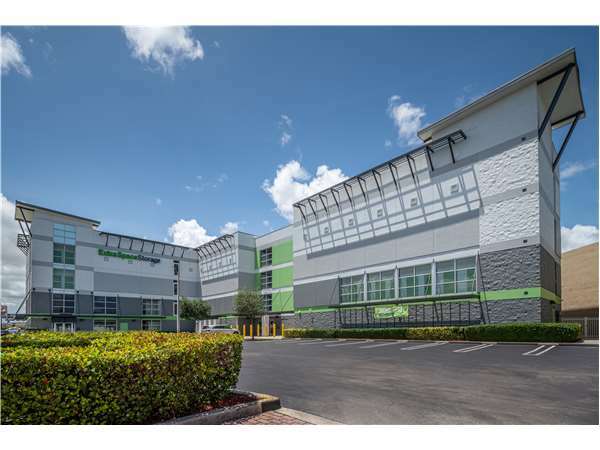 Located near the intersection of Okeechobee Rd and W 16th Ave, Extra Space Storage serves Hialeah residents near Hialeah Gardens, Medley, and Miami Springs. Locals will recognize our facility next to Shell a few minutes south of Miracle Mile Shopping Center. Extra Space Storage on Okeechobee Rd offers a large selection of storage units, climate-controlled storage, and exceptional security. We're your ideal storage partner in Hialeah! Extra Space Storage is the place to go for your storage needs. I'm extremely happy with the service and cleanliness of the place. But above all for the employees they have. Manager Angel and his Assistant Yessica are great, very helpful and professional. I highly recommend this place. Ricardo. This location is the perfect example of great customer service. They assisted me in picking the perfect unit size and was extremely pleasant in doing so. Many forget how important customer service is, it's all about being yourself, down to earth and friendly. was recommended to Extra Space Storage off Okeechobee Road by a (soon to be) family member. Fantastic price given for a 10 X 10 storage unit through the web site. The manager on site (Angel) was so helpful. The best customer service I've experienced in South Florida yet! The facility was clean and had great security features. All units are inside and have ample air conditioning. Very large elevators for fewer trips up and down (you can easily fit 3 large moving carts). Highly recommend! My experience with Extra Space Storage has been wonderful. The manager was on site and extremely helpful. The facility is clean and well-kept. I feel as though my belongings are secure. I actually don't mind going to the storage unit!! Putting my life away in a storage unit until I'm able to settle into a new home was overwhelming but going to extra space and meeting with the associates working there made my choice of company all worth the while. I saw the way they treated the existing customers, and their amiable, courteous and delightful attitude helped release some of the tension I was feeling. I am glad i chose Extra Space Storage. It's a good storage , clean , good space and good price and very important and the first thing a great costumer service . Trust me it's a great storage . I was given notice by Public Storage of a facility closure and I only had a short time to find a new storage place. I decided not to go with Public Storage but to look for a new place. I am so glad I did! This place is amazing. The storage unit is very spacious and the facility is clean and very secure. It doesn't have that nasty pressed partical wood smell like so many storage places. The front desk employee was so helpful and friendly. This is 10 miles from where I live but I don't care for the piece of mind I have that my belongings are stored at such top rate place. Thank You! We are the Red Clay and Gray colored building located on Okeechobee Rd between 16th and 18th avenue 1/4 Mile East of Arby's Next to Miami Depot. Take FL-826 S./Palmetto Expy South to US-27 E exit (Okeechobee Rd.). Turn left onto US-27 / Okeechobee Rd. The Facility will be on the left hand side in approximately 0.7 miles. Take FL-826 N./Palmetto Expy North to US-27 E exit (Okeechobee Rd.). Turn right onto US-27 / Okeechobee Rd. The Facility will be on the left hand side in approximately 0.7 miles. Take NW 42nd Ave/N Lejeune Rd to the Okeechobee Rd/US-27 North Ramp. Stay straight to go onto W. Okeechobee Rd. The facility will be on the right hand side in approximately 3.8 miles, N/W of Shell Gas Station just before the cross street of Okeechobee Rd. and W 16th Avenue. Take I-75 South toward Miami. Merge onto FL-826 South Palmetto Expressway. Take the US-27 / Okeechobee Rd. Exit. Turn left going SE on Okeechobee Rd. The facility will be on the left hand side in approximately 0.7 miles.